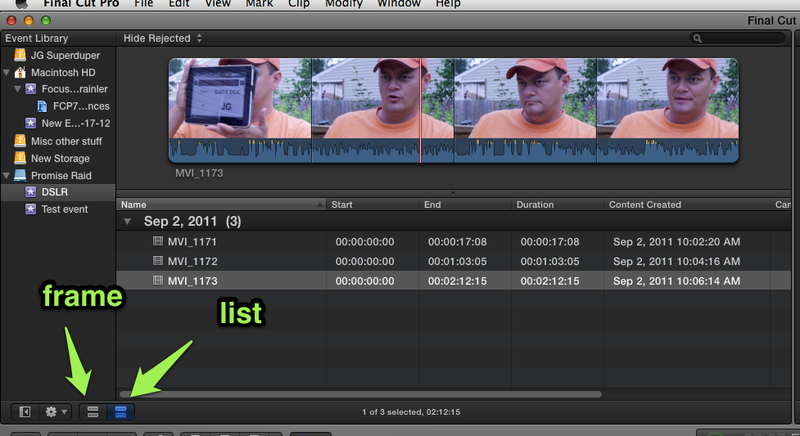 When I first started using FCPX, I made a major mistake. I switched it from Frame view to a Text view. After all, my entire editorial career has been working from the list view. Except, of course nowadays, everything is overshot - meaning that It may not be worth it to fill out all that information. FCPX handles frame view better, because it skimming through a finding a moment is a clip, as it helps you find a clip visually. The other big secret (the first being stay in frame view) is to change your zoom (Cmd + or - ) so that you can see 5 seconds. It's a perfect zoom level for skimming and selecting interview clips!